Visit the RAM Memory section of this website for information on it. DDR RAM memory has reached version DDR4, so if you are building a new desktop PC you should choose a motherboard that uses it and the AMD or Intel processor that you want to use. Both the latest Intel and AMD processors support DDR4 memory, so the motherboards that use those processors will have to support it as well. DIMM modules (DDR/DDR2/DDR3/DDR4 RAM) are very easily installed by first opening the clip at the end of each DIMM slot on the motherboard and then pushing the module vertically down into it so that the two end clips close around it on their own. You should make sure that the clips are fixed tight to the module. Installing the DIMM modules is merely a matter of pushing the module directly down into the DIMM slot as shown in the diagram below so that notch or notches on the connector edge of the module match the volt or volts of the slot. RAM memory does not require a device driver and therefore it is not listed in the Windows Device Manager. The DIMM module shown below has two notches that fit two volts in the slot shown under it. Note that DDR/DDR2/DDR3/DDR4 modules only have a single notch that is placed at a different point on the module for each type so that only the correct memory can be installed in a particular DIMM slot. The catches on each end of a slot should fit themselves over the module as it is pressed into the slot, but you can check to make sure that they are holding the module in place securely. Remember to make sure that you earth yourself to discharge any static electricity before touching electronic components such as RAM DIMM modules. This is best done by touching the computer’s case with the computer switched off and plugged into the mains supply that is also switched off. You should consult the motherboard’s manual to find out if the DIMM slots have to be filled in an order of rank. Some motherboards require that Bank 0 be filled first, followed by Bank 1 and 2, etc., while some motherboards allow any bank to be filled. 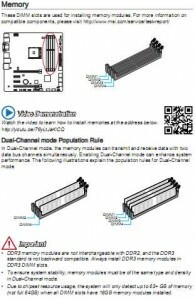 Dual-channel DDR/DDR2/DDR3/DDR4 RAM (compared to so called single-channel DDR RAM) is a misleading name that describes a mode of operation of existing DDR RAM, which allows, say, two ordinary DDR400 RAM modules to be accessed at an effective speed/frequency of 800MHz even though each ordinary DDR400 module has only a maximum effective speed of 400MHz. Any other speed of DDR RAM modules can also be used in this mode, such as DDR333, but the modules should preferably be of the same make, size, and speed, because the memory will all run at the speed of the slowest module. The single-channel mode of operation is nothing more than the standard way that DDR RAM has always been accessed by the memory controller. Note that if the motherboard supports both single-channel and dual-channel modes, which most of the dual-channel DDR motherboards do, the ordinary DDR modules might have to be installed in specific DIMM slots that are usually colour-coded to show which mode of operation they use. This is because the DIMM slots are accessed differently for each mode of operation by the motherboard’s chipset. You should consult the motherboard’s manual for the information on how to install DDR/DDR2/DDR3/DDR4 RAM in dual-channel mode. If you want to read the information for a motherboard that supports DDR/DDR2/DDR3/DDR4 RAM in dual-channel mode, download a manual for one from MSI’s website – msi.com. Any other motherboard manufacturer’s site will also provide manuals. If you can’t find the information you need in the RAM section of this website, using the web search term dual channel DDR (adding 2, 3 or 4, depending on which version you are using) will bring up plenty of links to sites and pages with information about the dual-channel mode of operation. Note that you don’t need to use an anti-static wrist-strap. Just have the PC connected to the mains but with the mains switch turned off and touch the side of the case before touching the RAM modules. The case is earthed via the mains and any static electricity in your body will be discharged by doing that.